Able to play on the wing and at outside-centre, Cummins came to prominence in a struggling Western Force side, where his pace and direct running provided rare attacking options. A former Australia Sevens representative - including at the 2010 Commonwealth Games - Cummins played games against England for the Australian Barbarians in 2010. 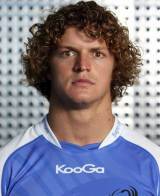 Nicknamed 'the Honey Badger', he also won a call-up to the Wallabies squad for the 2012 Rugby Championship.